Shouts of “ku kiai mauna” — the guardians of the mountain — reverberated off ancient cinder cones and dome-shaped telescopes Thursday at Mauna Kea’s summit as police led 12 arrested protesters away from the Thirty Meter Telescope construction site. They were among about 30 arrested on the mountain by Hawaii County Police and state Department of Land and Natural Resources officers as opponents of the $1.4 billion project staged another dramatic protest on a mountain they say is sacred ground. Tribune-Herald. Demonstrators vowed to continue their protest on Mauna Kea even though 31 people were arrested and charged Thursday with trespassing and blocking work vehicles from reaching the construction site of the planned $1.4 billion Thirty Meter Telescope. Star-Advertiser. Arrests were made yesterday on Mauna Kea Access Road. Protesters who oppose the construction of the Thirty Meter Telescope have been on the mountain for the past week, blocking access to construction crews. Hawaii Public Radio. Big Island police arrested twelve protestors Thursday. They were accused of blocking construction vehicles access to the summit of Mauna Kea. The crews were trying to get to the site to work on what will be the world's biggest telescope. Hawaii News Now. Scientists hoping to see 13 billion light years away, giving them a look into the early years of the universe, are facing opposition from Native Hawaiian groups who say the construction site of a new telescope is on sacred land. Associated Press. 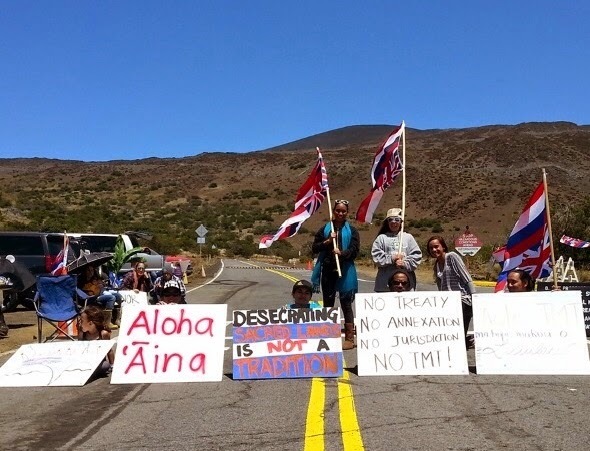 Four individuals were arrested today by DLNR enforcement officers on the Mauna Kea summit while protesting the construction of the Thirty-Meter Telescope. Hawaii Independent. Google may launch a new wireless phone service in Hawaii that seamlessly blends Wi-Fi and cellular networks together as part of a major plan aimed at shaking up the U.S. mobile phone industry, according to public documents. Pacific Business News. Trips by hundreds and perhaps thousands of Hawaii public school students could be in jeopardy after the state Ethics Commission said teachers are breaking the ethics law by accepting free trips from travel companies. Hawaii News Now. Parents seeking an "opt-out" for their children from standardized testing now underway in Hawaii public schools are being told that the state cannot grant the requests, according to new guidelines issued to schools. Star-Advertiser. Supporters of Uber, a ride-hailing service that allows customers to use smartphones to contact independent drivers, rallied Thursday against the state Legislature's first attempt to regulate the new industry. Star-Advertiser. A state House bill that would have set up a system for designating certain agricultural products as specifically Hawaii grown has been deferred following opposition from several Kona coffee farmers. The state Committee on Commerce and Consumer Protection deferred House Bill 1051 Wednesday. West Hawaii Today. The Hawaii Public Utilities Commission has set a timetable for the 29 intervenors and the Hawaii Consumer Advocate to follow in the major case involving NextEra Energy’s $4.3 billion acquisition of Hawaiian Electric Co., according to a public filing. Pacific Business News. A new state report estimates that Hawaii needs nearly 66,000 new homes to meet demand over the next 10 years. Civil Beat. A securities law compliance expert from a Honolulu investment advisory firm has been named Hawaii's securities commissioner. State Department of Commerce and Consumer Affairs Director Catherine Awakuni named Ty Nohara to the post. The department said Thursday the appointment is effective April 16. Associated Press. Gov. David Ige has agreed to release $5 million for planning and to solicit proposals to relocate the Oahu Community Correctional Center, an idea that has been promoted by Kalihi residents and their elected officials for years. Star-Advertiser. Dan Grabauskas, who serves as executive director of the Honolulu Authority for Rapid Transportation, on Thursday asked the agency's board to forgo any consideration of the $35,000 annual performance bonus that he's eligible for under contract. Star-Advertiser. State officials do not know how many state workers were allowed to leave early Wednesday to avoid a repeat of Tuesday's horrific H-1 freeway traffic jam, but likely hundreds of both state and city employees got paid to go home. Star-Advertiser. Hawaii County Prosecutor Mitch Roth is evaluating whether there are grounds for criminal charges against Mayor Billy Kenoi stemming from allegations of unauthorized use of his county credit card, state Attorney General Doug­las Chin said Thursday. Chin said he and Roth have been in talks regarding the matter. Star-Advertiser. More troubles are emerging for Big Island Mayor Billy Kenoi. The Hawaii County prosecutor’s office has launched a criminal investigation into Kenoi’s misuse of a government-issued credit card. KHON2. Already in political hot water for his $900 night at the Club Evergreen, Hawaii News Now has learned that Big Island Mayor Billy Kenoi also took the county credit card to the Camelot Restaurant & Lounge on Sheridan Street, dropping $400 at the hostess bar. Hawaii News Now. Hawaii County will need 19,610 new housing units over the next 10 years, as it leads the state in the rate of household growth over the decade. West Hawaii Today. Keauhou residents miffed about lack of cell service following tower removal. West Hawaii Today. Maui County lost out on more than $21 million in interest earnings when the county Finance Department failed to send payments from fiscal years 2010 to 2014 to the state agency that provides health and life insurance benefits to county employees, according to an independent audit of the department's Treasury Division released Thursday. Maui News. Maui Mayor Alan Arakawa said he is considering turning Maui Electric Co. into a publicly owned utility. Star-Advertiser. Maui Tomorrow Foundation is losing its executive director, Irene Bowie, who successfully assisted challenging the legality of the Hawaii Superferry operations, helped advocate returning more water to Central Maui streams and pushed for more environmental awareness overall. Maui News. Two of Maui’s beaches were featured in TripAdvisor’s 2015 Travelers’ Choice Awards for the best beaches in the US. Maui Now. Following the success of last year’s Hawaii on the Hill, plans are underway for another campaign June 9-10 in Washington, D.C. Sen. Mazie Hirono, who spearheaded last year’s event attended by more than 1,000 people, spent part of her Kauai itinerary Thursday visiting with local businesses that participated and made the gathering a hit. Garden Island. The Navy has underestimated the threat maritime exercises and the use sonar poses on marine life around Hawaii and California, a federal judge ruled Tuesday. Garden Island.